It was hot. A lazy plume of blue smoke wafted out over the gulf. The smoke was from a big grass fire that was burning up north. It would probably continue to grow until it rained. The smoke had made the cloudless sky above us a bit hazy and it seemed even hotter for it. It hadn’t rained here in many weeks. The locals were calling it a bad drought. It was the same drought that was smothering Texas. They needed rain everywhere around the Gulf of Mexico and we were no different. But we needed rain for what was, in comparison, a somewhat silly reason. We needed rain to drive the baitfish from the shelter they take in the mesh of the mangrove roots and out into the bays. 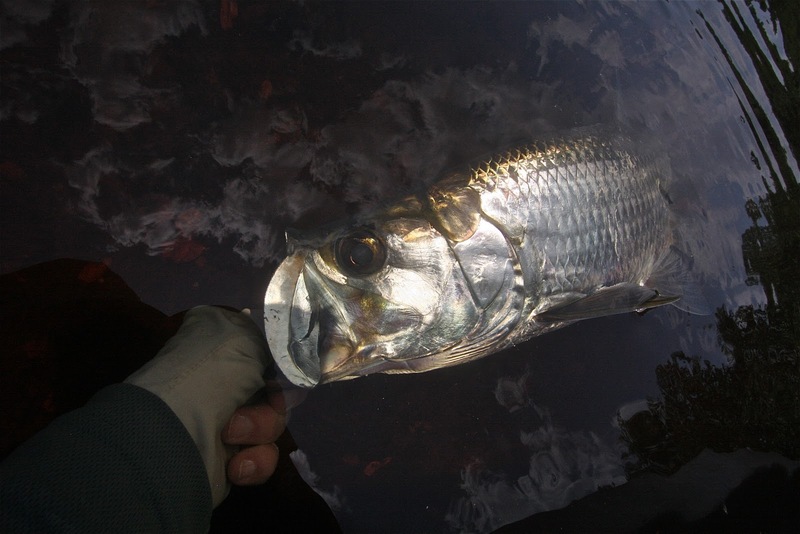 With the baitfish flushed out, the tarpon would come in to feed. If this was a normal year, it would have rained by now and the tarpon fishing would be red hot. But this year, the fishing was just OK. Not bad, but certainly not good. Everybody around the Gulf needed rain. Some for fire control, some for a respite from the heat and some of us for fish. Seaborn Jones and I were with Neko, our stocky Mayan guide. Neko was barely five feet tall, yet I had seen him carry six wooden cases full of bottled beer down a long dock while we were provisioning a tarpon camp. We had run this camp for a few weeks one spring a few miles south of Isla Arenas, about where the big fire was eating up the savannah. Neko was tough, with hands like burrwood. He could pole a big panga all day and pursued tarpon with a dogged determination. We called him the Tarpon Warrior when we had first fished with him, now so many years ago. He had trained all of the other guides who were all members of his extended family. Neko was the clan’s godfather. He was older, but still THE man. He knew this shore like the back of his weathered hand. The Los Petenes Reserve is a maze of undulating shallow bars, banks, rios and shallow lagos almost all of which is blanketed in lush, thick turtlegrass. It is a spectacular tarpon habitat. Acres of sardines school in these shallows and the tarpon gorge themselves not only on this bounty, but also on the many shrimp and crabs that live hidden in the shag of its turtlegrass carpet. Now, we were pulling into a small interior lago that lay hidden behind the outer bay’s mangrove fringe. We had reached this shallow “lake” after working our way thru a narrow channel that was completely overgrown with white and black mangrove tree branches. The mottled light in the channel was sublime, like being in a cathedral and to use this term to describe a mangrove forest somehow did not seem hackneyed at all. This lago was, at most, three feet deep and was choked with aquatic plants. I thought it unlikely that a tarpon, even a small one, would choose this backwater, but Neko grabbed his burnished, hand-hewn white mangrove pole and began to move us quietly across the lake’s surface. He poled expectantly as if this was the best spot on earth. I have learned not to doubt THE man. I made a few casts up against the shorter red mangrove bushes that formed our shore. Here hope flickered where yellow leaves swirled in the wind slicks. Seaborn and I had reduced the volume of our conversations since entering the channel. It wasn’t long before I saw a small shudder of water. Now we stopped chatting entirely and I made a long cast expecting a bonefish-sized tarpon to take a swipe at my grizzly whistler. I stripped the fly once... then twice... hoping it wouldn’t hang up on the weeds. A big mouth, a mouth disproportionately large for this skinny water, sucked in the fly. I scissored my fly line away from my rod and the fly came up tight. It was pegged solid. A big “baby” tarpon, a “sabalito”, exploded from the lago. It was big... certainly 18, maybe 20 pounds, I did not know. But in this skinny lago, it seemed huge as it tailwalked across the surface heading from one bank to the other. I couldn’t control the fish as it made jump after jump. Baby eh? If so, this was a childish tantrum of epic proportions and a demonstration of pure power that seemed anything but infantile. There was not enough depth rom which the tarpon could gain momentum. All the height of its jumps had to come only from a series of shallow tails strokes. Somehow these glancing strikes kept him permanently aloft. I was witnessing a barely containable force. It was pure and raw... and intoxicating. At one point, the hook pulled free. It skipped for a split second, then pulled tight again. If I had got it right, I was unbuttoned for only a fraction of a second. Maybe I was wrong, maybe I had only imagined it. The tarpon, after fighting both a bent rod and a strong cork drag, eventually came to the boat. I could see it was hooked at the top of its head. That must have happened in the split second that the fly skipped, evidently from its mouth to its head. I gave it no notice. It was a beautiful fish no matter how it was caught. Neko pulled the fish up and out of the water so I could take a quick photo of him with the fish. We got the fish back in the water and pulled the sharp Owner hook out of the top of its head. Blood seeped out through the wound. I had an unsettled feeling. We immediately set to reviving the tarpon. We ran its huge mouth back and forth thru the lago’s warm waters. All the while, a thin stream of red flowed from its head wound. After a tense minute, Neko tentatively released the fish. It finned weakly for a few feet and then turned on its side. As it came toward me, I grabbed it by the mouth. This time I more adamantly set about to revive it. The fish slowly flared its gills, but it was not gaining strength. I needed to do better. Without much thought, I jumped overboard. I didn’t know how deep it was when I jumped, but I soon found out. While the water sloshed at my waist, I was mired to the middle of my calves in a fetid mix of snail shells, vegetable muck and mangrove leaves. Neko looked at me as if I was insane or at best, a bit unusual. Maybe I was nuts. Or maybe I was a sentimental fool. But I wanted this chrome creature to survive. He was so cool: big patterned silver scales, gill plates intricately etched like the finest filigree, a broad black tail, the huge dispassionate Megalops eye, an elegant filamentous caudal fin and of course, a ladle for a mouth. I did not want to kill such a magnificent fish. I took the fish by the lower jaw and spun circles pulling the fish through the water. This forced more water over the tarpon’s gills than we could have done from the boat. It seemed to me our only hope. As I spun, I churned up more and more goo. Repeatedly, I checked for signs of life. All I got was a weak flaring of the gill plates. When released, the fish went belly up. After a half dozen more attempts, the fish finned out of my hands. He made two weak tail thrusts then turned on his back and sunk to the bottom. His white belly shone brightly against the dark bottom. Now, I felt a bit crazy. I don’t really know why. These things happen. I had done my best. Move on. But for some inexplicable reason, I found myself diving underwater, still with my sunglasses on, looking for the tarpon in a swirling mix of mud and muck. I surfaced gripping a silver fish jaw. Water streamed off my hat, sunglasses and chin. I knew I was treading in an area of truly demented behavior. Seaborn and Neko must have been appalled, but the look on Neko’s face betrayed nothing. I smiled at him sheepishly. He smiled back at me and shook his head back and forth as in, “There is no hope.”. It was a kind look. It was not the look of a local who sees fish only as a source of food. I handed the fish up to Neko and hauled myself up and onto the panga’s gunnel. I swirled my feet in the water to clean the stinking muck off my feet and calves. By the time I had swung my legs aboard, Neko had stored the fish out of sight underneath the front deck. It was now someone’s dinner. Neko briefly touched my shoulder and said, “Gracias”. I think I knew what he meant. ...for more info on this destination click here.